Huge, enormous thanks to an amazing, crazy-smart, twitter friend, who came through with this post on mythology. She’s so much fun on twitter and I had NO idea she studied my favorite thing ever. Mythology! If you’re into it like we are, then this one’s for you. ENJOY!! It’s no big secret that the Romans assimilated a lot of the Greek pantheon and culture. Seeing that both cultures lived in close proximity, that’s not surprising. Zeus became Jupiter, Hermes turned into Mercury, Athene showed up as Minerva. Even minor Greek gods appear in the Roman religion. I personally find it rather interesting to see how closely the two religions resemble each other. In both, the gods are unpredictable for the humans living with them in the same world. The gods give little to no thought to the humans and reward or punish them according to their whim. Their feuds and petty rivalries jeopardize human life more often than not, and they behave like spoiled children most of the time, celebrating in a luxurious realm. The only exception to this rule is (not a real god but one of the last titans) whose story is exactly the same in both religions. He helps creating the humans and brings them the fire that Zeus/Jupiter wants to keep for the gods. This story alone shows that the Greek and Roman thought their gods like over-emphasized humans with the same but amplified faults. In contrast, the Norse gods are much darker and brooding. 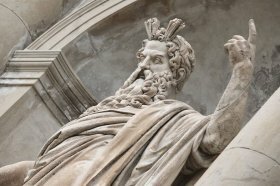 Although they, like the Greek/Roman gods, are a pantheon with lots of family ties and one ruling god, the way their respective worshipers saw them differed greatly. The Norse gods were much more approachable for the humans and less unpredictable. True, they also had their feuds, but they were more personal and hardly ever involved humans. Loki enjoyed playing tricks on the other gods and then they struggled with each other, not with humans. All-father Odin issued few punishments despite (or maybe because) knowing things that were to come. The only real punishment I remember is . 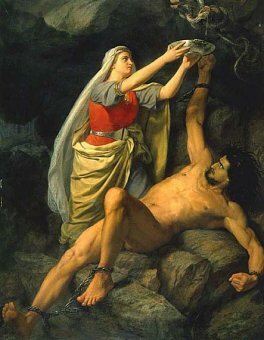 They allow his wife Sigyn to stand beside him to catch the venom in a bowl, giving Loki spells of relative peace until she has to empty the bowl (True, none of the gods, Greek, Roman and Norse were particularly nice to each other). All-father Odin’s main goal was to gain as much knowledge as possible even at high costs to himself. The gods were not playful like Greek and Roman gods, but preparing for the final battle between the different realms of their world. One thing that seems to be the same in all three of the religions is the belief that the lives of humans and gods alike were predetermined by the Fates (or Nornes in Norse mythology). In all three religions, three women governed everything that happened in the past, now, and future. Thus, the Nornes/Fates are more powerful than the gods. I think it rather surprising that the concept behind such an important part of religion as the personal freedom of the individual, be it god or human, is the same in all these religions. To me, it suggests either a crosspollination of the religions or an adaptation of an even older, now forgotten religion. Interestingly, in the Roman and Greek religion, there’s just one place where souls go after death: the underworld ruled by Hades/Pluto. There, the souls deemed unworthy are sent to Tartarus (equal hell) and the worthy souls go to the Elysian fields (equal heaven). The underworld is circled by a river and guarded by a three headed dog. Imagine my surprise when I found that one of the Norse underworlds looks just the same. Helheim, the home of the goddess of death, Hel, is circled by a river that even the gods can only cross into her realm but not back out, and it is guarded by… a monstrous dog. Those souls (human and god alike) who died from diseases, accidents, old age and such would go to Helheim upon their death. But Norse mythology held three more places souls could go after death. The most widely known is Valhalla, where Odin collected the most courageous fighters for Ragnarok. Men who died fighting but didn’t outshine others would go to Folkvang. Finally, drowned sailors would be collected by Ran to her hall. 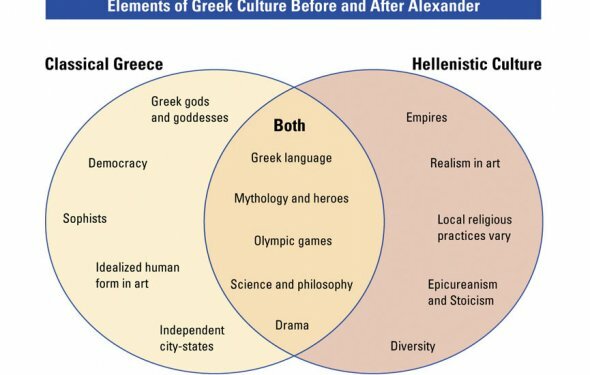 An interesting difference between Roman and Greek concerns the role of humans in the religion. Whereas the heroic deeds by the Roman gods were more important than the actions of men, in Greek mythology, humans were just as important as goods because they contributed significantly to the society. Also, in Roman mythology, good deeds and heroic acts could elevate a mortal to a god-like status. The Greek are much more concerned with the physical life on earth. The afterlife seems to have a much smaller importance in everyday life than in Roman or Norse mythology (I’m not an expert so don’t crucify me if I’m wrong). The most important difference between Roman and Greek gods and the Aesir is that in addition to a myth of creation (all three have similar myths of creation: the slaying of older gods/giants), the Norse also have a myth of destruction. During this final fight, Ragnarok, all gods would fall. The whole universe of the Nordic gods would be destroyed. However, it would not end. From the ashes, a new world would rise with two humans. Also two gods, Balder and his blind brother Hod, would be reborn, and together they would begin a new world. 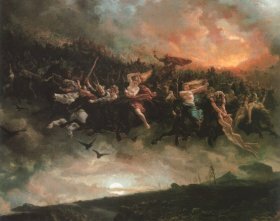 For me, that makes the Nordic mythology a more advanced sort of religion, one that looks past its own demise – that’s rare even in today’s religions. I find it fascinating to see how much of what has been hidden from the wave of Christianization burning through Europe survived, and how much could be reconstructed from the few sources that remained. Without a doubt the Greek and Roman religions and their cultures have influenced the way the Christian religion developed, and thus played a major role in the way humans in Europe evolved and spread throughout the world. The impact of the Nordic myths and legends is less visible. I know that they have been misused in the Third Reich, and still there are many people who misuse them to this day. However, I personally believe that the Nordic myths and legends shaped our point of view much more than we give them credit for.